When implementing the application, we decided to work with one of our long-time application development partners, 2-steps-ahead, who has been building voicebots on our IVR and chatbot platform, Aspect CXP™, for over a decade. Internally, we had all of the right people in place and ready to take on this project: Aspect Professional Services provided the project management and architectural support, R&D provided support by our on-staff linguists. With the combined forces of our team and 2-steps-ahead we were ready to embark on the buildout of the solution. The project kicked off with a workshop in Lidl’s Wimbledon England HQ at the end of August 2017. 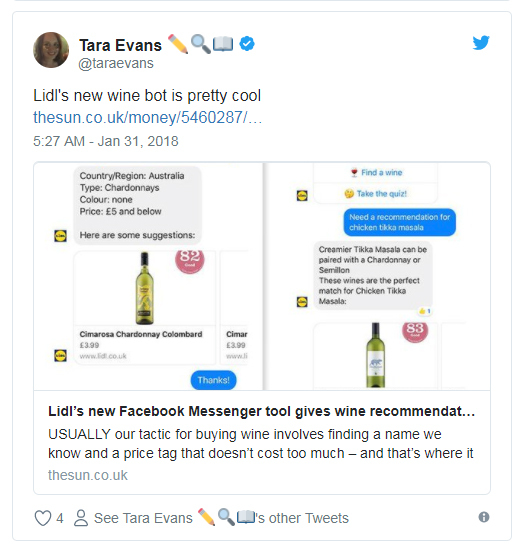 The Lidl digital marketing team came with a thorough understanding of how a chatbot experience should look and even a high-level concept of the functionality it should provide. One of the main drivers for this project was the realization that, while Lidl was successful with their wine selection, winning awards and increasing sales, they didn’t have anyone in their 800+ stores or their contact center that knew much – if anything – about wines. The knowledge was sitting with their full-time on-staff sommelier! The Lidl team wasn’t interested in sharing that knowledge through static content on a website like an FAQ; instead, they wanted to create a much more interactive and engaging way through which they could impart their wine knowledge on their customers. Artificial Intelligence allowed them to accomplish that by creating a chatbot accessible via Facebook Messenger that could answer questions from customers directly, on the spot. They clearly understood the power of a Conversational UI (CUI) for an engaging customer experience! 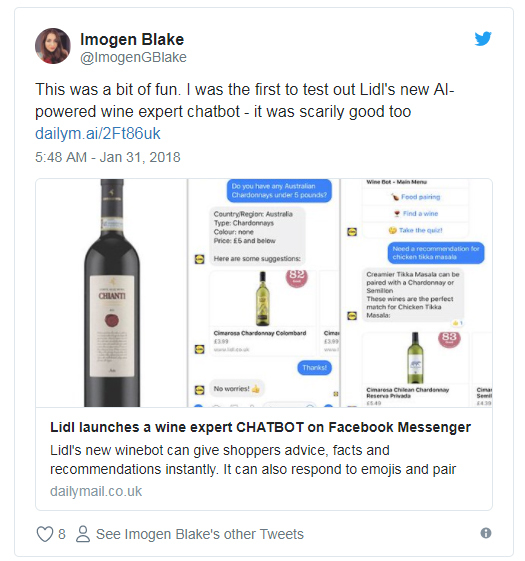 A name for the chatbot was quickly found by the Lidl team: Margot – chosen to remind the wine connoisseur of the French wine-making region (Margaux), while generally being a popular first name in the UK. What Can You Do, Margot? On a high level, Margot is trained to help customers with 4 different types of inquiries, as the chart shows. In addition, it can direct users to the existing Store Finder, which will pop up as a webview within the Facebook Messenger app. One of the key decisions we made together with the Lidl team was to put Margot on the main Facebook page of Lidl UK: www.facebook.com/LidlUK. Previous experiences have shown that if you create a separate page just for a chatbot, discovery and retention suffer severely. By adding her to Lidl’s main Facebook presence we were sure that Margot had her home in the heart of the social Lidl experience online. Lidl UK has several full-time staff members that help with answering questions from social networks. Margot thus “collaborates” with live staff in the sense that they are monitoring the incoming messages for mentions of the desire to speak to customer service, and the user always has the option to involve live staff when needed. From a CUI design perspective, we decided to go with a mix of natural language dialog and menu-based flows. The initial menus introduce the scope of the solution and provide basic guidance; from our 15+ years of experience of building these kinds of applications, we know that people can be overwhelmed if they know they’re chatting with a computer and feel they can’t interact with it like they would with a human when presented with an open-ended question such as “how can I help you” – they simply expectsome guidance in the form of menus. Over time, as these chatbot experiences establish themselves across brands, these hesitations should go away. In the middle of the project, we came up with the idea to teach Margot to understand emojis. What if people asked her about  or ? We didn’t want to pass on the opportunity to add that element of fun to the mix. Generally speaking, the Margot persona was designed to be light-hearted and informal; a true wine enthusiast but definitely not snooty, someone who loves food and good company. Margot is truly conversational in her style, answering questions as such as “which red wines from Chile under £6 do you sell”, “what goes well with grilled salmon”, or “how do I get that stain out of my tablecloth? ?” She has additional features, such as an interactive wine quiz to encourage further brand engagement and to interact with customers in a fun, intuitive, and light-hearted manner. From a linguistic perspective, Margot was a welcome challenge for our linguists. Not only was Margot designed to allow for plain English inquiries such as “I’m making roast beef for my friends tonight, what should I get with that”, or questions including multiple items of information as in “looking for a red wine from Italy under 6 pounds”, or those staccato communicators that send a single word such as “rose”; but Margot was also to benefit from the food ontologies built into Aspect NLU, the natural language understanding engine embedded in Aspect CXP™, so that she could easily subsume inquiries about ziti, farfalle, macaroni, spaghetti, tagliatelle, rigatoni, vermicelli, fettucine, pappardelle, penne, fusilli, … under pasta, or roquefort, gorgonzola, stilton under blue cheese, or … you get the idea. With the built-in ontology, Margot can now easily help with thousands of food items, offering over different 200 individual recommendations. 8 weeks after our initial project meeting we were ready to get serious… Margot was ready for friendly user testing from Lidl brand advocates. Lidl announced Margot on the Lidl Community, and first testers signed up. Testing chatbots early is critical to their success, and needless to say, we quickly found areas for improvement and gaps that we had to close, whether it was missing Mexican cuisine examples in our food ontology, or the ability to parse out money amounts expressed as diversely as “£5”, “5£”, “5 quid”, “a fiver”, or even “around five-ish”. Through a QA phase of intense collaboration between the teams, we were able to squash the bugs in record time and approach deployment readiness. When we did go live, we decided for a soft rollout, before announcing Margot to the press. However, when the press embargo was finally lifted on January 31st, the feedback we got from the media, our partners, the analysts, but also Lidl customers expressing their joy of interacting with Margot on Twitter, was overwhelming positive, getting coverage in Contact Center World, Daily Mail Online, Telegraph, Food and Wine, and our favorite was this video from the Huffington Post, who invited a real sommelier, Janet Harrison from Cracking Wine, to “compete” against Margot. Who won? Itching to chat with Margot yourself? Go to www.facebook.com/LidlUK and hit “Send Message”. Or jump right into the conversation by going to m.me/LidlUK. Stay tuned for more updates on the coming to life and the adoption of Margot over the coming weeks and months. Many new features are being added as we speak, and both teams aren’t running out of ideas what else automation, artificial intelligence-style, can do to support Lidl on their journey to the top of the UK and international grocery retail space. And this journey has just begun. Interested in finding out more about the topics in this blog or Aspect? Aspect is one of the subject matter experts that will be sharing their insights and expertise at Customer Response Summit Charleston, March 12-14, 2018. CR Summit Charleston will feature speakers from Neiman Marcus, Indeed, Capital One, T-Mobile, and more. For more information about our leading event for CX professionals, visit our event website.